Mount Shishaldin /ʃɪˈʃældən/ is a moderately active volcano on Unimak Island in the Aleutian Islands chain of Alaska. It is the highest mountain peak of the Aleutian Islands. The most symmetrical cone-shaped glacier-clad large mountain on earth, the volcano's topographic contour lines are nearly perfect circles above 6,500 feet (2,000 m). The lower north and south slopes are somewhat steeper than the lower eastern and western slopes. The volcano is the westernmost of three large stratovolcanoes along an east–west line in the eastern half of Unimak Island. The Aleuts named the volcano Sisquk, meaning "mountain which points the way when I am lost." The upper 6,600 ft (2,000 m) is almost entirely covered by glacial snow and ice. In all, Shishaldin's glacial shield covers about 35 square miles (91 km2). It is flanked to the northwest by 24 monogenetic parasitic cones, an area blanketed by massive lava flows. The Shishaldin cone is less than 10,000 years old and is constructed on a glacially eroded remnant of an ancestral somma and shield. Remnants of the older ancestral volcano are exposed on the west and northeast sides at 4,900 to 5,900 ft (1,500 to 1,800 m) elevation. The Shishaldin edifice contains about 120 square miles (310 km2) of material. A very steady steam plume rises from its small summit crater which is about 500 ft (150 m) across and slightly breached along the north rim. This volcano has had many recorded eruptions during the 19th and 20th centuries, and a couple reports of volcanic activity in the area during the 18th century may have referred to Shishaldin as well. Therefore, the volcano's entire recorded history is spotted with reports of activity. AVO has 24 confirmed eruptions at Shishaldin, making it the volcano with the third most confirmed eruptions (after Akutan and Pavlof). However, Shishaldin has the most eruptions (this means confirmed AND possible eruptions) in Alaska, but half of the eruptions are unconfirmed, with the most recent one being in January 2015 . Mount Shishaldin's most recent eruptions were in 1995–96 and 1999. Since the 1999 eruption, it has maintained seismic activity, typically having very low-magnitude volcanic earthquakes (most are below magnitude 1) every 1–2 minutes. During this period of non-eruptive seismic activity, it has been puffing steam, with puffs also occurring about every 1–2 minutes. There were reports in 2004 of small quantities of ash being emitted with the steam. The Alaska Volcano Observatory monitors the volcano for more hazardous activity with seismometers and satellite images. Visual observations are rare, because of the remote location of the volcano. The first recorded ascent of Shishaldin was in 1932, by G. Peterson and two companions. 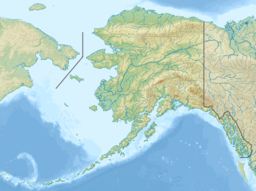 Given the straightforward nature of the climbing ( Alaska Grade 1, snow up to 40 degree slope), it is possible that an earlier ascent occurred, either by native Aleuts, Russians, or other visitors. Shishaldin is a popular ski descent (6,000 feet/1,830 m vertical) for local climbers (of whom there are few). Due to its remoteness, Shishaldin is not often climbed by outsiders. A view of the volcano's 1999 eruption. Map showing volcanoes of Alaska Peninsula. Shishaldin (left) and Isanotski volcanoes on Unimak Island. Shishaldin Volcano on the west end of Unimak Island. "Shishaldin". Global Volcanism Program. Smithsonian Institution. Michael Wood and Colby Coombs, Alaska: a climbing guide, The Mountaineers, 2001.